Brazil’s president-elect Jair Bolsonaro has pledged to clean up politics, crack down on crime, and set a new direction for his country. “We cannot continue flirting with socialism, communism, populism, and leftist extremism. 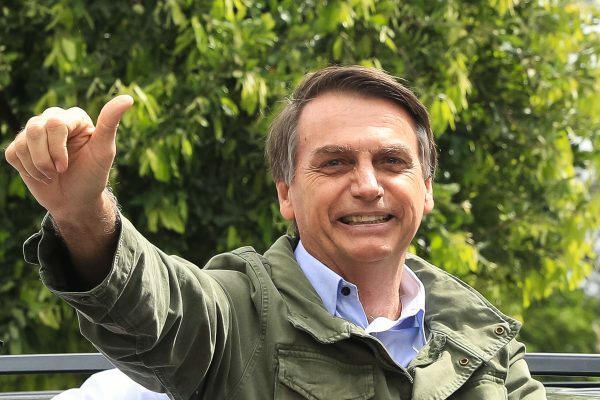 … We are going to change the destiny of Brazil,” Bolsonaro said in his acceptance address, adding that he will work to root out graft and stem a tide of violent crime. The conservative lawmaker said that he’ll govern according to the Bible and the country’s constitution. Trump called Bolsonaro on Oct. 28 to congratulate him on his election victory and both men expressed a strong commitment to work together, the White House said. Bolsonaro won 55.2 percent of the vote in the run-off election, compared with 44.8 percent for left-wing hopeful Fernando Haddad of the Workers Party (PT), according to electoral authority TSE. The rise of the 63-year-old congressman and former army captain was propelled by the rejection of the leftist PT that ran Brazil for 13 of the past 15 years. The party was ousted from power in 2016 in the midst of a deep recession and political graft scandal. 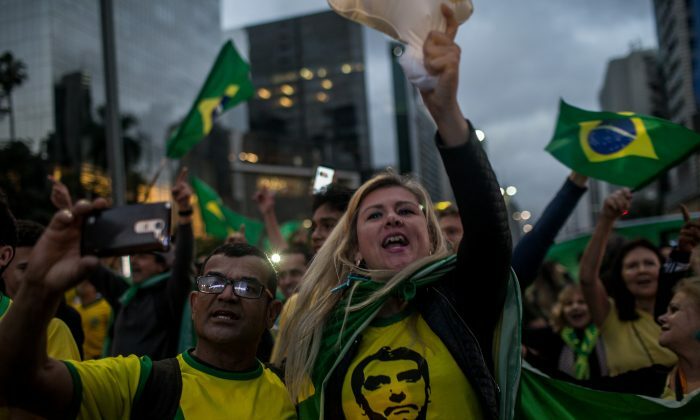 Tokyo-listed Brazilian stock exchange-traded funds (ETFs) jumped more than 12 percent when Japanese markets opened, following Bolsonaro’s win. Bolsonaro said he will “unite Brazil” by cutting bureaucracy and red tape for businesses. He said he’s committed to fiscal discipline and called for the early elimination of the federal government’s budget deficit. “We are going to think in terms of more Brazil and less Brasilia,” he said, referring to the nation’s capital, where he will take office on Jan. 1. While on the campaign trail in late August, Bolsonaro said in an interview with The Epoch Times that his highest priority is improving Brazil’s economy. He added that he was inspired by Trump’s policies to reduce “the tax burden” and stimulate the economy. “When Trump took over as the president of the United States, he started to fulfill his promises, leaving the Trans-Pacific Partnership and the Paris Agreement on Climate Change, which is an attitude I also would like to take,” Bolsonaro said, although more recently he indicated that he no longer plans to leave the Paris climate accord. Bolsonaro also spoke out against some of the countries Brazil currently has strong ties with, particularly China, a major trading partner of Brazil. Vinícius Fontana in Brasilia and Reuters contributed to this report.